The word went out on Facebook that my son-in-law Justin wanted a turntable for Christmas to try out the LP craze. Apparently the fine Sony noise cancelling headphones I gave him for Christmas last year planted a seed and the seed has sprouted. 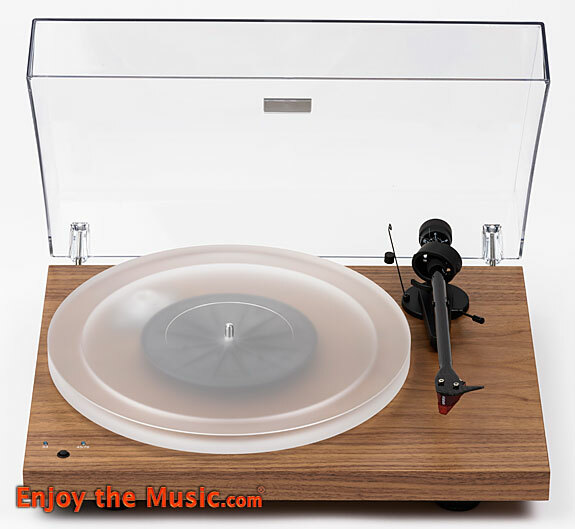 The $90 turntable on his list was a turnkey unit with cartridge and built in phono stage. All he would have to do is connect it to his mid-fi surround sound receiver. But you and I both know I couldn’t let him go down that dead-end road. He’s now 40 and steeped in debt from earning his MBA at Northwestern. He commutes to work by train almost an hour each way and puts in long hours of hard mental work. Then he comes home each day to put on his “World’s Greatest Dad” hat. He deserves a better turntable. It’s not like I could afford an entry-level Da Vinci nor had a spare VPI review sample lying around to give him. Later that night I went down to the basement and threaded my way to an army green metal shelving unit that held a handful of mid-fi garage sale turntables from the 1970s. There were a couple of Duals, a Technics (not the one you’re thinking of) and a few more. Ultimately, I stretched out my arms and lifted a heavy Sony PS-X55 from 1981 off the top shelf. This was my last turntable before I discovered High End audio back in the early 1990s. The Sony was a direct-drive fully-automatic table that I had been planning to take to the limit with many of the tweaks I’ve applied to the Linn. But as the saying goes, you can’t really have something unless you can also let it go. Justin was thrilled with the “new” table — even with one broken hinge that precluded using the plastic dust cover. I promised I would try to fix the broken one and search eBay until I could locate one. I had already sent an inquiry to a guy who had just a replacement dust cover for this particular table to see if he might also have a good hinge. A week after we returned from Chicago, the seller got back to me and I shelled out another $30 for the damn hinge. In the mean time I had figured out, first, that these hinges are incredibly difficult to repair and second, this particular hinge was identical to the hinges on the dust cover of my vintage Linn LP12. So I had Plan B up my sleeve. Actually, the real Plan B was to pick up a Schiit Mani phono stage so he could use the turntable with his Onkyo receiver that lacked this feature. LPs are dead, remember? Right! And I’ve got thousands of them in my crypt at home. I raise them from the dead, one at a time, whenever I need an emotional fix. Apparently, I’m not alone as electronic gurus Jason Stoddard and Mike Moffat seem to be able to put food on their table selling these phono stages for a mere $129 plus shipping. Jason tells me the Mani was designed by Mike. Their story has been told often enough that there is only small oversight in omitting it here. If you want a nut and bold history of the company, Jason has already done it on Head-Fi here. And if a YouTube of these guys telling their stories doesn’t already exist, somebody should grab a camcorder. I checked their website and was surprised to see no one had published a review yet. A subsequent search on Yahoo turned up a bunch of generally positive reviews. Oh well, here’s some icing on their cake. I emailed Jason and told him my story. He had previously accommodated a request for a Bifrost DAC for the $5000 Entry Level Project that was published here back in 2014. I found the Bifrost to be an outstanding value—even more so with the addition of some ERS paper to quell the EMI/RFI. Jason helped me out with free shipping and enough of an industry discount for a nice lunch — it’s only a $129 product, after all and a mere pittance compared to my reference phono stage. The Mani arrived from the far coast via FedEx faster than originally estimated — surprising, given the winter storms that have disrupted the holidays and late-season football this year. The box is very sturdy and well designed to cradle both the Mani wrapped in plastic and the accompanying wall wart power supply in its own lightweight cardboard box. The other surprise was the absolute size of the Mani. I had read the dimensions but the “professional” photos give no clue that this little puppy sits in the palm of your hand. The fit and finish of the unit were a clear step above the Bifrost of five years ago and far above anything I would expect from off-shore in this price league. BTW, it’s made here in the States in Valencia, California, like all their products. The top and wrap-around faceplate, held down by screws, offered the possibility of easily sliding in a piece of ERS paper. Four little rubber-like feet had substantial grip on the kitchen countertop and eventually, the metal top of my reference phono stage. I liked that a lot as I was using substantial interconnects that might pull on the 16 oz. unit. I ask you now, in the following photo, where’s Waldo? The polished stainless steel component on the right with the tubes is my Coincident Statement Phono Preamplifier and the polished stainless steel unit below it is the power supply for it. The little unit atop the phono preamp with the bright white light is the Schiit Mani. Your opinion of the bright white light will vary depending on whether you see it as a night light for navigating your room while listening in the dark or have it at eye level where it will blind you. (Duct tape will blend in nicely with the chassis if you wish to mask it.) The Mani is small enough that you may be able to hide it behind a larger component or stack it on top of another piece of Schiit gear in your rig. If it wants to roam, half a brick will anchor it in place. Since it only draws 4 watts, I’ve left it on continuously and lowered my carbon footprint elsewhere in the house. If you insist on turning it off, there is a small power switch on the back along with the RCA inputs and outputs and the binding post for the turntable ground wire. The bottom contains recessed switches for Gain 1 and Gain 2 which allow you to achieve four levels of gain ranging from 59dB for moving coil cartridges on down to a low of 30dB which is considered Decca Mode — something new to me, too. Signal to noise ratios increase from 59dB in moving coil mode to 82dB in standard moving magnet mode and a high of 90dB for the Decca mode. Check their website for more data. Cartridge loading is more basic with a switch between 47 kOhm for mm and 47 Ohm for mc cartridges. While the switches appear inexpensive, rest assured that they are well protected and will not likely cause you problems. In this price league you are probably not going to be swapping cartridges on a daily basis. More likely, it will be “set it and forget it.” If you’re more passionate about precisely loading your megabuck mc cartridge, you will not be looking at this phonostage anyway — which could be a mistake I’ll get into later. And for comparison, my reference phono stage offers mc cartridge impedance loads of 3-10, 11-30, 31-100, 101-300 Ohms so 47 Ohms is a good, general setting. For my listening, I used the excellent Charisma Audio 103 MC cartridge (based on the Denon 103 cartridge) which has a recommended loading range of 100-1000 Ohms, so I was running it a little hot. Priced at $750, the high-resolution Charisma 103 might seem a little pricey to mate with a $129 phono stage but… well, read on. After letting it run for three days I took my first listen. The results were predictable, coming from a tube phono stage to solid state, but the level of excellence was not. Nor did I let my expectations override my perceptions. The bass was deeper and tighter and the treble was clearly focused with more energy and extension than my reference. It didn’t take the bass of my Kharma speakers into the 20Hz range, but the low 30s were noticeably more solid than I achieved with the Coincident phono preamp. At the top end cymbals had more energy and more colorful and distinct shimmer. Very soft, rapid tapping on the cymbals with drumsticks and soft brushes on the cymbals appeared where before they went unnoticed by my aging ears. Conclusion: greater dynamic range? Yes, but only if you can forgive a slight bleaching out of tonal color in the treble at loud levels, which was probably due to the limitation of the 47 Ohm loading of the Charisma 103 cartridge. At modest levels, this was not a problem and if you’re a head banger, you will revel in the slight pain and probably beg for more by turning up the volume to the point of clipping your amp. The biggest surprise for me, which is suggested by the tight bass and more defined treble, is the increased resolution across the midrange. It wasn’t as prominent a difference as the bass and treble — after all, tube gear is cherished for its glorious midrange, but the resolution was tight across the key board with the Mani. The increased cognition of difficult or subtle song lyrics and the appearance of micro-dynamics that had been undetected were evidence of this. The increased energy in the treble as well as the improved resolution created a sense of somewhat greater transparency of the recording venue. My system was already very strong in this regard, so you might experience even more prominent results if your system is on the dark side. This being written close to Presidents’ Day and recalling the tale of George Washington and the fabled cherry tree, I cannot tell a lie. Early on I modified the Mani with a sheet of ERS paper. Yes, the same stuff that has been used beneath the wallpaper at US Embassies to counteract espionage. I first reviewed ERS along with its early supplier, Stillpoints, back in 2003 and I have been using it quite effectively in various components ever since. It is amazingly cost effective. The top of the Mani comes off easily with the removal of four Philips-head screws. I cut a piece to fit from a stock 8″x11″ that cost around $25 in the non-adhesive version years ago. You will have plenty of leftover material to use in other components so figure it adds another six bucks to the cost of the Mani, bringing it up to $135 — still a bargain. A pencil was used to puncture a hole in each corner for the screw to pass through. The results? Gone was the slightly hard edge to the attack of the notes and more refined was the decay such as the shimmer of cymbals. The music became more liquid and relaxing without losing any apparent resolution. Win-win. I had used ERS in the Schiit Bifrost DAC with very similar results. So what does it do? Simply, it absorbs the EMI/RFI bouncing around inside the chassis and cleans up the signal. Given the way it is affixed to the Mani, there is zero chance of it falling down and contacting the circuit board. With other components you may want to use some tape to attach it firmly, but here — don’t worry, be happy. Well, you’d have to be an even more esoteric, snobbish, tube-loving SOB than me not to love the Mani — particularly when you receive your monthly bank statement. But I did notice a few slight downsides to the Mani. And these were only downsides depending on your particular preference of sonic values. You can’t have everything, no matter what your budget. There are always compromises and your room is usually the biggest compromise of all, if not your significant others or offspring. To witness, the soundstage of the Mani (as well as most solid state gear) is foreshortened. The width is as good as it gets with my speakers aligned on the long wall—which is to say excellent. But with the tight bass and higher energy in the treble replacing the rolled off focus in those areas in my tube phono stage, plus the holographic nature of tube gear in general, the Mani presents a wide, very well defined, evenly lighted soundstage that is shallower in depth than my reference. The other area that differs is the tonal color and shading that tube gear provides. The Mani is slightly less rich in tonal color and nuance than my tube reference. How much less, you ask? Well, let’s just say that it’s a lot less than the $6370 price difference. But unless you are really new to the High End, you already know about diminishing returns. The other significant event during my listening to the Mani was the installation of a dual-layer constrained damping bottom plate from Stack Audio (Great Britain) on the bottom of my heavily modified Linn LP12 turntable. I wrote to Theo Stack: The effect was immediately noticed in the applause of the audience leading into the first song when I lowered the tonearm — even though I was still standing behind the right speaker. Further listening throughout the evening well into Valentine’s Day confirmed my instantaneous impression that you’ve got a real winner. The point here is the Mani phono stage immediately revealed the upgrade to the turntable. I didn’t play around with alternate cartridges, but it is a safe assumption that the Mani will do appropriate justice to the quality of whatever cartridge or turntable you can afford. Might I suggest that a better cartridge will sound better without sounding like a fool? The Mani will do it justice. From what I’ve just said you can surmise that the Schiit Mani is an incredible value. Moreover, in an age when the middle class is shrinking and the spread between the very upper class and the masses is accelerating, the entire Schiit line stands out like Prince Valiant. To put it another way, as productivity rises while wages stagnate, can the High End be far behind Harley Davidson as the wealthy Baby Boomers age out of the hobby? More poignant yet, Schiit Audio components are sized-right and priced-right for the small confines of assisted living and retirement communities as well as the proverbial basement dwellings of Millennials still living with their parents. Those in between these extremes are the potential saviors of the fine art of listening to high resolution music reproduction. Many will begin on the headphone path and others will risk annoying their neighbors with traditional loudspeakers. In either case, Schiit has the bases covered. We can only hope that Jason and Mike live long and healthy lives, and have to wisdom to ensure the longevity of the company beyond their tenure. Unfortunately, most of us come to the High End from modest systems and with little knowledge of what we really want from a system or how important the room is in limiting our goals. It takes time and experience to learn these things. You’re not alone. The port of entry is often a dealer whose job it is to sell you what he has to offer, rather than what you might really need or don’t even know that you need. Unless the revival of vinyl becomes even more popular than cell phones, $129 phono stages will not keep the doors open at a brick and mortar establishment. Schiit Audio is the Plan B of high-end audio for those of limited means and a willingness to do their homework by reading reviews, frequenting the forums and risking ordering sight unseen, sound unheard. The risk here is minimal with only the effort to repack the product and send it back with return authorization at a 15% restocking charge within 15 days of receiving it. In the grand scheme of High End audio, a $20-25 lesson will pay itself back many times over. But I doubt you will be returning it, even for repair. BTW, the warranty is two years for the original owner. Again, look at the parts count and the build quality. You’re not likely to be sending it back. By keeping the parts count low and the signal path short, Schiit has created a minor masterpiece in the Mani that should thrill any newcomer and satisfy most of us for decades until our wealth exceeds some pretty wild dreams. This is not to say that you will experience the same outstanding results I have. After all, I plugged it into a rig that costs well into five figures in a well-designed dedicated listening room that I’ve honed over eighteen years. On the other hand, my son-in-law will be starting out in his basement rec room with an Onkyo home-theater receiver, a couple of decent, but not high-end speakers, a 1981 Sony direct drive turntable with a cartridge that costs less than a hundred bucks and some decent home-made cables. I expect he will be thrilled to have access to vinyl, but more importantly, beyond that, if he chooses to pursue High End audio, the Schiit Mani will likely be the very last component he will have to upgrade, if ever. Most likely, you’re somewhere between these two extremes and for $129 the Schiit Mani is a real gift to yourself. Enjoy your music! Note: Ratings are with ERS paper installed in Mani. Deduct 0.5 clef notes without ERS paper where applicable.